To restore the power that Nedry foolishly shut down (and thereby regain a technological advantage over the dinosaurs), Dr. Sattler must head into the utility bunker that routes power to different parts of the park. Once she is there Hammond, back in the Visitors Center, communicates to her via two-way radio that operating it is a two part process: Manually providing a charge to the main panel, and then closing each of the breakers. 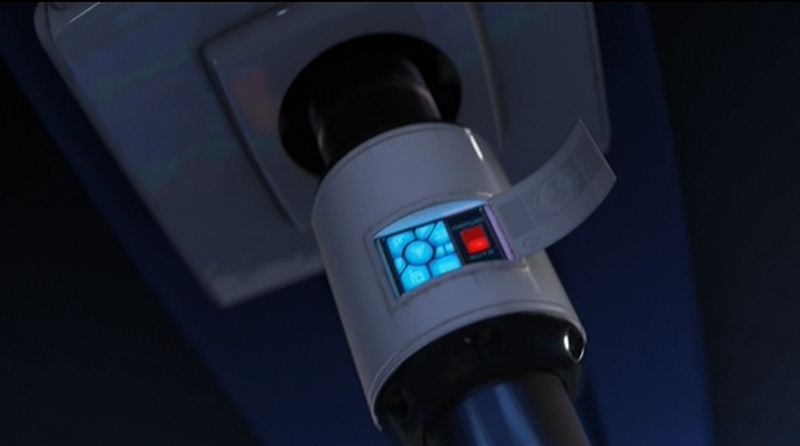 To restore a charge to the main panel, she manually cranks a paddle (like a kinetic-powered watch, radio, or flashlight), then firmly pushes a green button labeled “Push to Close”. We hear a heavy click inside the panel as the switch flips something, and then the lights on the Breaker Panel list light up green. Loki’s wants to take down the Avengers and the S.H.I.E.L.D. helicarrier, to disable the two greatest threats to his invading forces. To accomplish this, he lets himself get captured and the glaive taken away from him, knowing Banner would study it, fall prey to one of its terrible effects, become the ragemonster, and wreck the place. That effect goes unnamed in the film so I’ll call it the bad mojo radiator. The longer people hang around it, the more discord it sows. In fact just before Loki’s thralls enact a daring rescue of him, we see all of the Avengers fighting in the lab, for no other reason than they stand in the glaive’s presence. When his battalion of thralls are up and harvesting Vespene Gas working to stabilize the Tesseract, Loki sits down to check in with his boss’ two-thumbed assistant, an MCU-recurring weirdo who goes unnamed in the movie, but which the Marvel wiki assures me is called The Other. To get into the teleconference, Loki sits down on the ground with the glaive in his right hand and the blue stone roughly in front of his heart. He closes his eyes, straightens his back, and as the stone glows, the walls around him seem to billow away and he sees the asteroidal meeting room where The Other has been on hold (listening to some annoying Chitauri Muzak no doubt). Several times throughout the movie, Loki uses places the point of the glaive on a victim’s chest near their heart, and a blue fog passes from the stone to infect them: an electric blackness creeps upward along their skin from their chest until it reaches their eyes, which turn fully black for a moment before becoming the same ice blue of the glaive’s stone, and we see that the victim is now enthralled into Loki’s servitude. The initial invasion of Klendathu is disastrous, and our hero Rico suffers a massive penetration wound in combat, with an Arachnid digging its massive, thorn-like pincer straight through his thigh. The other major benefit to the users of the chair (besides the ease of travel and lifestyle) is the total integration of the occupant’s virtual social life, personal life, fashion (or lack-thereof), and basic needs in one device. Passengers are seen talking with friends remotely, not-so-remotely, playing games, getting updated on news, and receiving basic status updates. The device also serves as a source of advertising (try blue! it’s the new red!). OK, back to the social network. It isn’t obvious what the form of authentication is for the chairs. We know that the chairs have information about who the passenger prefers to talk to, what they like to eat, where they like to be aboard the ship, and what their hobbies are. With that much information, if there was no constant authentication, an unscrupulous passenger could easily hop in another person’s chair, “impersonate” them on their social network, and play havoc with their network. That’s not right. It’s possible that the chair only works for the person using it, or only accesses the current passenger’s information from a central computer in the Axiom, but it’s never shown. What we do know is that the chair activates when a person is sitting on it and paying attention to the display, and that it deactivates as soon as that display is cut or the passenger leaves the chair. We aren’t shown what happens when the passenger’s attention is drawn away from the screen, since they are constantly focused on it while the chair is functioning properly. If it doesn’t already exist, the hologram should have an easy to push button or gesture that can dismiss the picture. This would allow the passenger to quickly interact with the environment when needed, then switch back to the social network afterwards. And, for added security in case it doesn’t already exist, biometrics would be easy for the Axiom. Tracking the chair user’s voice, near-field chip, fingerprint on the control arm, or retina scan would provide strong security for what is a very personal activity and device. This system should also have strong protection on the back end to prevent personal information from getting out through the Axiom itself. Social networks hold a lot of very personal information, and the network should have protections against the wrong person manipulating that data. Strong authentication can prevent both identity theft and social humiliation. While the total immersion of social network and advertising seems dystopian to us (and that’s without mentioning the creepy way the chair removes a passenger’s need for most physical activity), the chair looks genuinely pleasing to its users. But like a drug, their enjoyment comes at the detriment of almost everything else in their lives. There seem to be plenty of outlets on the ship for active people to participate in their favorite activities: Tennis courts, golf tees, pools, and large expanses for running or biking are available but unused by the passengers of the Axiom. In an ideal world a citizen is happy, has a mixture of leisure activities, and produces something of benefit to the civilization. In the case of this social network, the design has ignored every aspect of a person’s life except moment-to-moment happiness. This has parallels in goal driven design, where distinct goals (BNL wants to keep people occupied on the ship, keep them focused on the network, and collect as much information as possible about what everyone is doing) direct the design of an interface. When goal-driven means data driven, then the data being collected instantly becomes the determining factor of whether a design will succeed or fail. The right data goals means the right design. Wrong data goals mean the wrong design. Instead of just occupying a person’s attention, this interface could have instead been used to draw people out and introduce them to new activities at intervals driven by user testing and data. The Axiom has the information and power, perhaps even the responsibility, to direct people to activities that they might find interesting. Even though the person wouldn’t be looking at the screen constantly, it would still be a continuous element of their day. The social network could have been their assistant instead of their jailer. One of the characters even exclaims that she “didn’t even know they had a pool!”. Indicating that she would have loved to try it, but the closed nature of the chair’s social network kept her from learning about it and enjoying it. By directing people to ‘test’ new experiences aboard the Axiom and releasing them from its grip occasionally, the social network could have acted as an assistant instead of an attention sink. Moment-to-moment happiness might have declined, but overall happiness would have gone way up. The best way for designers to affect the outcome of these situations is to help shape the business goals and metrics of a project. In a situation like this, after the project had launched a designer could step in and point out those moments were a passenger was pleasantly surprised, or clearly in need of something to do, and help build a business case around serving those needs. The obvious moments of happiness (that this system solves for so well) could then be augmented by serendipitous moments of pleasure and reward-driven workouts. As soon as the Axiom lands back on Earth, the entire passenger complement leaves the ship (and the social network) behind. It was such a superficial pleasure that people abandoned it without hesitation when they realized that there was something more rewarding to do. That’s a parallel that we can draw to many current products. The product can keep attention for now, but something better will come along and then their users will abandon them. A company can produce a product or piece of software that fills a quick need and initially looks successful. But, that success falls apart as soon as people realize that they have larger and tougher problems that need solving. Ideally, a team of designers at BNL would have watched after the initial launch and continued improving the social network. By helping people continue to grow and learn new skills, the social network could have kept the people aboard the Axiom it top condition both mentally and physically. By the time Wall-E came around, and life finally began to return to Earth, the passengers would have been ready to return and rebuild civilization on their own. To the designers of a real Axiom Social Network: You have the chance to build a tool that can save the world. We know you like blue! Now it looks great in Red! The Hover Chair is a ubiquitous, utilitarian, all-purpose assisting device. Each passenger aboard the Axiom has one. It is a mix of a beach-side deck chair, fashion accessory, and central connective device for the passenger’s social life. It hovers about knee height above the deck, providing a low surface to climb into, and a stable platform for travel, which the chair does a lot of. We see that these chairs are used by everyone by the time that Wall-E arrives on the Axiom. From BNL’s advertising though, this does not appear to be the original. One of the billboards on Earth advertising the Axiom-class ships shows an elderly family member using the chair, allowing them to interact with the rest of the family on the ship without issue. In other scenes, the chairs are used by a small number of people relaxing around other more active passengers. At some point between the initial advertising campaign and the current day, use went from the elderly and physically challenged, to a device used 24/7 by all humans on-board the Axiom. This extends all the way down to the youngest children seen in the nursery, though they are given modified versions to more suited to their age and disposition. BNL shows here that their technology is excellent at providing comfort as an easy choice, but that it is extremely difficult to undo that choice and regain personal control.